A game room can provide your family with fun at all hours of the day. Read this guide to learn how to build the ultimate game room. When looking to make an addition to your home, there are few options more enjoyable than adding a game room. But, this doesn’t mean you have to build an entirely new room. You could convert an office, old bedroom, or nursery into space for your game room. But that’s just the beginning, you’ll need to decide what you’re going to have in it. The possibilities are nearly endless, but some options stand out from the rest. Not sure where to start? Don’t worry, we’ve got you covered. This is the most important aspect of the room to keep in mind. You’re going to be upset if all of the furniture and decorations you want to add make the room feel too small (or don’t even fit!). Therefore, you should measure first and then go from there. Lighting is crucial for setting the mood. If you’re looking to watch movies or relax, you’ll want to have dimmer switches in place so that you can control the ambiance. Lighting is also (obviously) important for seeing things clearly. Larger rooms can get surprisingly dark if there aren’t enough lights in place. Playing board games won’t be very fun if you’re struggling to focus because it’s difficult to see, so plan on installing new lights if you don’t have enough already. If you plan on having large groups of people in your game room, a couch likely isn’t the only piece of furniture you’ll need. You’re going to need other locations throughout the room for people to sit. But, you can get creative here. Bean bags, lounge chairs, and even hammocks are great options. If all else fails, regular chairs or stools will work. Just make sure you have something to accommodate everyone in the room. Now, we can finally get to the best part: the actual games. After you’ve decided how you’re going to arrange the room without the games, you can focus on what you want to add. Casino games are often quite fun to play at an actual table, but losing money can offset that enjoyment. But, since it’s your room, you’re in control of what happens when you win or lose a hand. Having a casino table complete with cards and chips can give you the real experience without all the negatives. It’s also a great way to spend a Friday night with friends. Arcade cabinets can be pricey, but you can find decent deals on used equipment. Classics like Pacman, Galaga, and Space Invaders can add a unique, vintage feel to the room that few other decorations can rival. Regardless of which machine you choose, though, it’s important to take size into account, as most arcade cabinets are much larger than people anticipate. You have a wide variety of options when it comes to how you set up your monitors. You could mount them, keep them inside an entertainment center, or on a desk/table. The game system placement is dependent on the monitor location, but you have the option of keeping it concealed or exposed. If you have space (and the budget), you could even set up multiple monitors throughout the room to accommodate larger gatherings. The best part about building your own room is that you are in complete control of what you add to it. But, no game room is complete without a pool table. You also don’t have to stick with traditional green felt when it comes to choosing which table you want to add to your room. There are endless options for creating a custom pool table to make sure it’s the perfect fit. As always, you’ll need to consider how much space you have before you run out and buy one. But, you’ll also need to keep in mind the space that players need for their shot so that the cue doesn’t damage your property. In general, it’s a good idea to have five or six feet of space on all sides of the table so that you can play comfortably without worrying about accidents happening. As with a pool table, you’re going to need a significant amount of space to play on a ping-pong table comfortably. The last thing you want is to have a wide swing break the screen of a monitor, knock over a drink, etc. 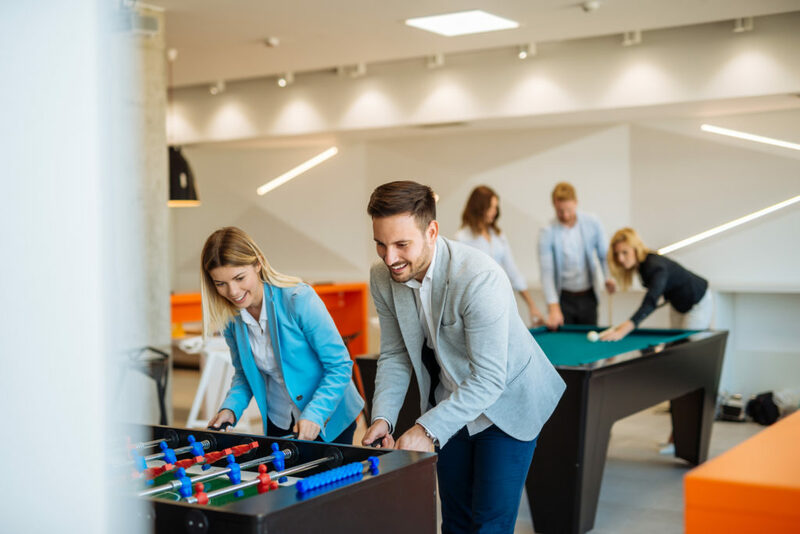 But, given the right amount of accommodation, a ping-pong table provides a great opportunity for casual and competitive play and is also something that people of any age can participate in. For people who prefer a game with less maneuvering than ping pong or pool, a dartboard is a great option to have available. All you’ll need is enough space to mount the board on the wall and enough room between you and the board when you throw. Just make sure not to get too crazy when it’s your turn, though– you wouldn’t want to end up with holes in the wall! Building the perfect game room seems difficult, but with our help, it doesn’t have to be! With the above tips, you’ll be able to create the perfect game room for you and your family that you can enjoy for years to come. Want to learn more home improvement hacks? Check out our blog!